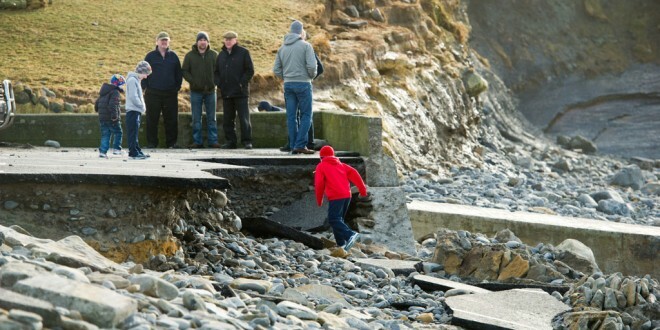 People examine part of a badly damaged car parking area at White Strand, Miltown Malbay following high seas and gales. Photograph by John Kelly. THE Clare Champion’s live coverage of the 2014 Local Elections was the most popular item on www.clarechampion.ie over the last 12 months. All the major events in Clare life were reported on the website in 2014, with thousands turning to the site as their main source of local news. In the months of January and February, the most viewed stories online related to the storms that threw the county into chaos. The Champion’s coverage included striking images showing the fallout in coastal areas, such as Lahinch, Quilty, Kilbaha, Kilkee and Spanish Point, which drew thousands of visitors. On March 25, news of the death of Ennis businessman, Jimmy Brohan was published online and read by thousands. The story about his death paid tribute to his personal warmth. “Jimmy was on first-name terms with his customers from far and near, most of whom simply enjoyed stepping back in time when they passed through the door. He will be missed as one of Ennis’ great characters,” the story stated. The most-read story in April followed the gruesome discovery of a number of dead animals, which were dumped in West Clare. 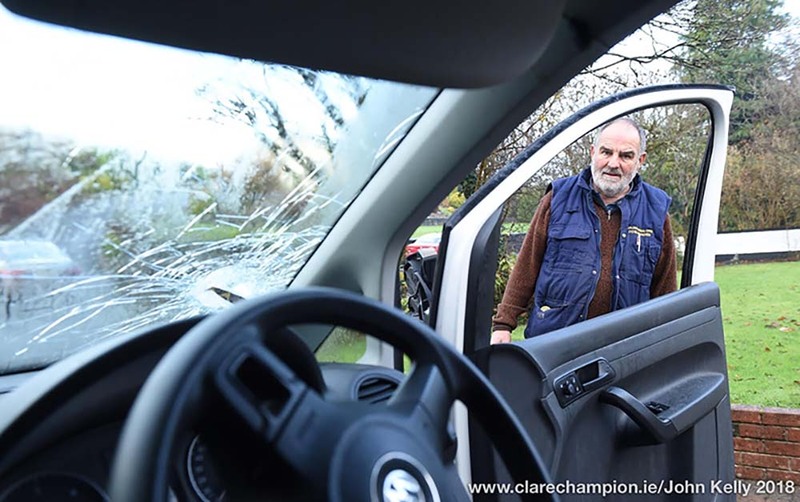 Published on April 3, the story outlined the scene in a picturesque part of Clare. “Four authorities are investigating the grim discovery of the carcasses of at least 16 horses and cattle at the base of Baltard Cliffs in Doonbeg. “Clare ISPCA warden Frankie Coote, having visited the site on Wednesday, described what he saw as a ‘planned and sinister’ operation. Another horse that lay dead within 200 yards of the cliff edge had, in fact, been put down by a veterinary surgeon on Monday. “Up to 15 of the animals were located close together at the bottom of the stunning, isolated cliffs, while another dead horse lay close by when The Clare Champion visited the scene on Tuesday,” Peter O’Connell reported online. In May, the Champion’s live coverage of the local election results proved a massive hit with the public, drawing tens of thousands of views. Over the course of two days, there were constant updates on the various counts, along with interviews featuring those who won seats and were unsuccessful. In June, Clare were knocked out of the Munster Hurling Championship following a comprehensive defeat against Cork and a controversial piece of analysis of Clare’s display was the most popular item published on the site that month. It stated, “Podge Collins must also feel somewhat isolated by Davy Fitzgerald’s after-match comments on dual players. Reaching the heights of last year was always going to be a huge challenge for the Cratloe man, whether he played football with Clare or not. While claiming that the dual-player option is a non-runner, the Clare manager must surely acknowledge that Aidan Walsh and Damien Cahalane were outstanding for Cork. Both are dual players. Remember, the Cork footballers are a Division 1 team, unlike their Clare counterparts. Clearly the Cork management teams are working together to make sure that it works, although that will be tested if their footballers reach the Munster final. In July, the most-visited story on clarechampion.ie was news that Kinvara in South Galway was the first village in the country to unite against Israel’s military action in Gaza. Kinvara’s business community agreed to operate a boycott of Israeli goods, in protest against the “ongoing bombardment” of Gaza. According to the Irish Palestine Solidarity Campaign (IPSC), Kinvara was the first and only town in Ireland to take this collective action. In August, the most-viewed news story on the site related to county dog warden, Frankie Coote’s discovery of a dying German shepherd in West Clare. 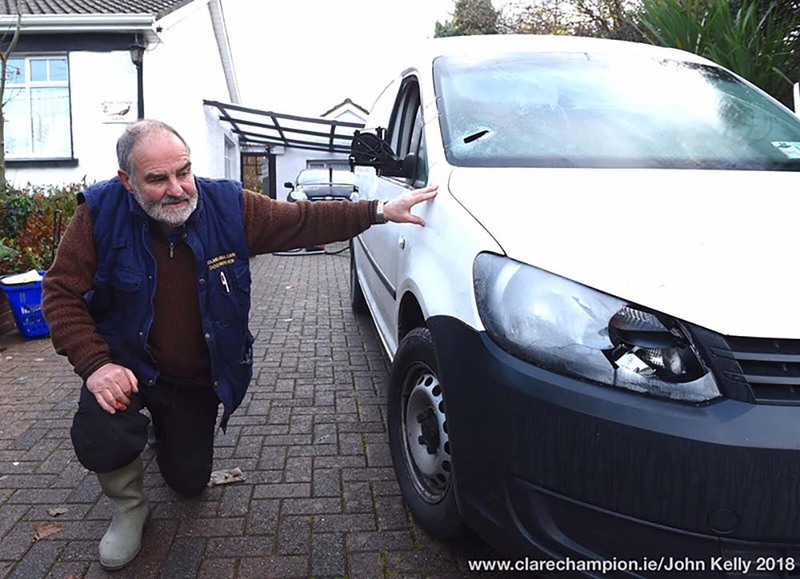 He described it as the worst incident of animal neglect he had dealt with in his 23-year association with the ISPCA. On the back of an anonymous call, accompanied by Garda Seán Kelly from Kilrush Garda Station, Mr Coote called to the house, behind which the stricken dog lay. “We see bad things and you just get on with your job but I think people need to know what’s actually happening out there and see if we can curtail it from happening again,” he said. Meanwhile, in September, garda confirmation that they had located 15-year-old Sixmilebridge teenager, Dylan O’Doherty safe and well attracted thousands of hits. He had been last seen at home in Cappa Lodge eight days prior to going missing. 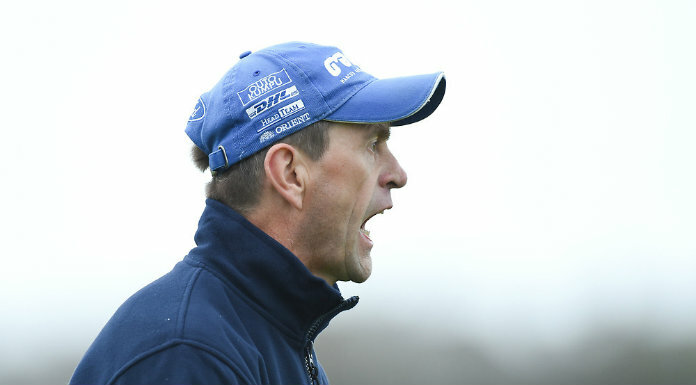 News that Donal Moloney was to take on the role of county U-21 hurling manager for two seasons attracted much attention on The Clare Champion website in October. Following the decision of Gerry O’Connor to step down from being joint manager, due to his work commitments, Moloney was unanimously ratified for the role at the October meeting of the county board. In November, the news that RTÉ commentator, Marty Morrissey had been selected as the Clare Association in Dublin Clare Person of the Year attracted huge interest on the website. The Mullagh man will be presented with his award at the association’s annual dinner dance in the Clyde Court Hotel in Ballsbridge on Saturday, January 31. Also honoured on the same night will be Seamus MacMathuna, originally from Gower, Cooraclare, who will receive the association’s Hall of Fame award for 2015. Meanwhile, in December, the shock and grief of residents in Clonlara following the death of Brian Morrissey (24), Mount Catherine, Clonlara was evident in the number of visitors reading about the tragedy. The former St Munchin’s College student was a versatile sportsman, excelling as a midfielder with Corbally United, where he is fondly remembered by numerous people involved in the club, and secondary school rugby. 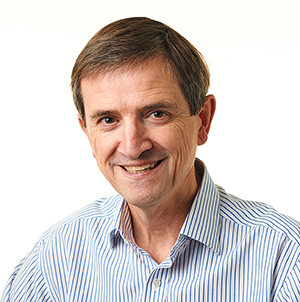 He also played soccer with Ringsend, when he moved to Dublin to work in The Irish Times a few years ago. While Mr Morrissey was in St Munchin’s, he featured on the school’s junior cup team in 2005 and senior cup team in 2008. 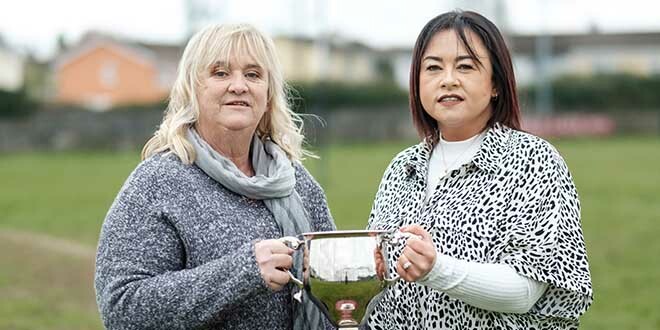 The annual Ciarán Twomey charity memorial game, which was due to be held by Corbally United on St Stephen’s Day, was cancelled as a mark of respect.